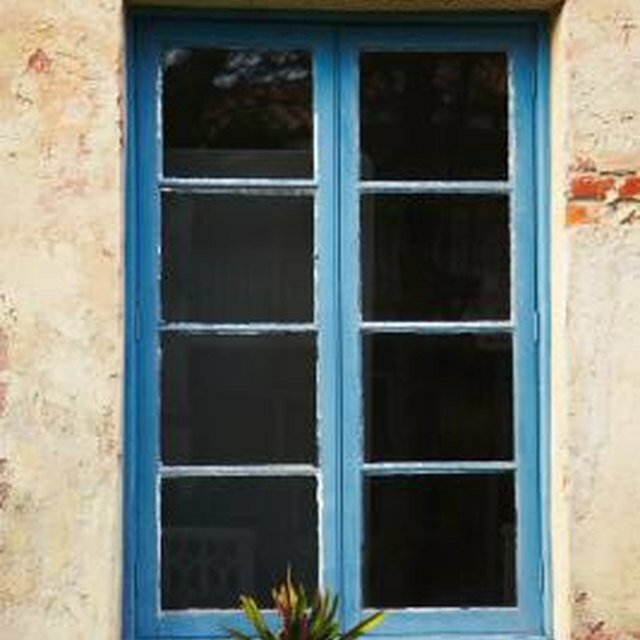 A sideways sliding window might cause a problem for the installation of a standard window-unit air conditioner. Although a window unit could be installed with some adjustments, a portable air conditioner unit is a perfect match for a vertical window. The unit sits on the floor, instead of inside the window frame. A window-unit air conditioner is used to cool a single room. A portable air conditioner can be used in any room with a power outlet and a window. The ductwork for the portable air conditioner connects to a hole in the supplied installation component that fits into the sliding window. When the air conditioner runs, air from the room is sucked into the system through the intake grille. Moisture and some impurities are removed from the air and exhausted out of the back of the unit. The impure air must be able to flow through the ductwork to the outside air. Should the dirty air exhaust inside of the room, the cool air, which is generated by the air conditioner, would be canceled out by the hot exhaust. The supplied portable air conditioner window component fits into any sliding window, whether it’s vertical or horizontal. The component is rectangular with a hole to accommodate the ductwork and can stretch to fit a wide opening or shrink to fit a narrow opening. Once the component is stretched to the width of the window opening and the ductwork is attached, you can slide it between the windowsill and sash and close the window down on top of the piece. To secure the window, L brackets can be screwed into the sides of the frame at the top part of the open window. Like a central and window-unit air conditioner, a portable air conditioner features a condenser fan and cooling element used to cool the room. Typical buttons, such as “Fan Speed,” “Mode” and “Dry,” are found on the control panel, and some units come with a remote control. The “Dry” feature is a dehumidifying function, a cycle that draws moisture from the air. Because a portable unit must sit on the floor inside the home, collected moisture is unable to drain outside. This is unlike a window unit, which allows condensation to drip out of the back of the unit outdoors. Portable units house drain tanks or pans, where excess moisture accumulates. When the tank is full, the cooling component shuts off until the tank is drained. Sometimes it’s necessary to carry the entire unit outside or to a drainage area to drain the tank. What Is a Twin Mulled Window? Why Do Particles Blow Out of the Fan of an Air Conditioner? Do Air Conditioners Circulate Air From the Inside? What Is a Direct Vent Heater? Why Does the Air Conditioner Run Continuously?